Of course everyone’s bodies and metabolisms are very different, however it’s important to have at least something small in your stomach. This doesn’t mean heading down to the local café and ordering a burger with the lot and chips on the side, usually something simple such as a banana or small snack should suffice. An empty stomach can sometimes make you feel queasy and unsettled, whilst on the other end of the scale having an overly full-stomach isn’t the best idea before a flight either. Balance is the key! Water is your friend. Keeping hydrated is the key to most minor health concerns in life and this applies to flying as well. (Sorry we’re not sure if this will help with your heartache after catching a barra in the Ord River that was one centimetre short of a metre – that’s for you to sort out). Making sure you have had enough water the night before your flight is crucial, however there’s something very important to note here. Knocking back three bottles of water in the morning before your flight will not be ideal, as it’s likely that you and your bladder will not be friends by the end of the flight. Stick to small sips throughout the flight to keep your body and mind happy, which will give you more time to soak up the stunning views beneath you. Yes yes we know that you are on holiday and it’s time to relax and unwind and the Kimberley is the greatest place in the whole wide world and you can’t pass up a few beers or wines after a big day… BUT! Alcohol is definitely not a wise choice the night before your scenic flight. Clearly it’s self-explanatory why a fierce hangover would be the worst possible way to experience your flight of a lifetime, but even just a few too many with dinner can sometimes add a bit of unnecessary queasiness to your flight. Have a good meal, stay away from that tempting red, white or amber liquid and get an early night. And that’s an order! (Okay maybe one or two are fine, but you get the point). Here at Aviair we like to treat you the best we possibly can before, during and after your flight over the amazing East Kimberley region. After your flight, one of our lovely team members will greet you in the terminal with a cold cotton refresher towel. The towels are sandalwood scented which comes from locally grown sandalwood trees here in Kununurra – the oil from the trees is known for it’s health benefits and relaxing properties. Taking in this scent from the cool towels at the end of your flight will be just what you need. It’s said that repetition is one of the best ways to help something to sink in to your memory, so here it goes… Air con, air con, air con, air con, air con, air con, air con, air con. 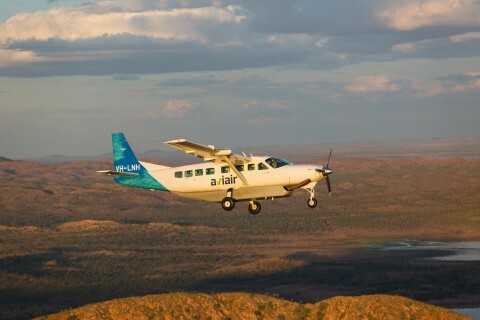 Aviair are the only company in the East Kimberley with a fully air conditioned fleet of aircraft. To have that beautiful cool air directed straight on your face during a flight can make the world of difference. (Some say that it made them forget that they were on a flight but instead felt like they were sitting in the fluffy white clouds outside, but we’ll leave you to make your own observation). Air con with Aviair, air con with Aviair, air con with Aviair. Now that you are a full bottle on tips to avoid airsickness, please feel free to contact us on (08) 9166 9300 if you are interested in booking your flight of a lifetime in the East Kimberley! Please note that the above are suggestions only. Please visit your doctor for any medical issues.